JUDGES: Brian Joseph, Clint Black & TBD. WINNER: Klein Wong by Arm Bar at :37 seconds of round 1. WINNER: Josh Elliot by Triangle choke at 2:29 of round 2. WINNER: Austin Fahad by Rear Naked Choke at :44 seconds of round 1. David Thompson received a 30 day Medical Suspension until April 22nd, 2019. WINNER: Michael Justice by TKO at :48 seconds of round 3. Nick Albrecht received a 30 day Medical Suspension until April 22nd, 2019. WINNER: Daniel Miller by Triangle choke at 1:07 of round 1. WINNER: Bryar Burnham by Rear Naked Choke at 2:15 of round 1. WINNER: Isaiah Washington K0 at :15 seconds of round 1. Josh Brook received a 60 day Medical Suspension until May 22nd, 2019. WINNER: Jose Gallegos Rear Naked Choke at 1:35 of round 1. WINNER: Jordan Nash by Unanimous Decision, 30-27, 29-28 & 29-28. WINNER: Anthony Saeger by Unanimous Decision, 29-28, 30-27 & 30-27. 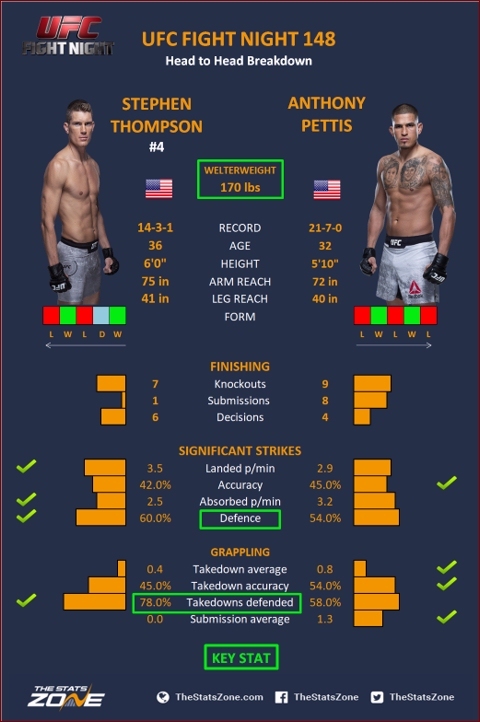 There are some connections some may not know between two top MMA contenders, Stephen Thompson and Anthony Pettis. The two meet up in a UFC match-up at UFC Fight Night 148 in Nashville, Tennessee this Saturday night. Lets look at how they compare and the similarities between the two. Thompson's last high profile fight was against another Duke Roufus fighter, Tyron Woodley. As many noticed after their first meeting, which ended in a draw, Woodley had a major chip on his shoulder. As one fan put it, "He is in constant tug of war with himself." The majority watching had Thompson winning the fight, so a rematch was inevitable. In the rematch, Woodley squeaked out a close majority decision victory, 48-47, 47-47 and 48-47. To many, because it was so close, fight fans were hoping to see a Woodley vs Thompson 3, but it would never be. Eight months after their meeting, Thompson defeated Jorge Masvidal by unanimous decision. After Masvidal Thompson was once again met with bad luck, bad judging, controversy, whatever fight fans want to call it when he meet Darren Till of England, in England. To begin with, Till missed weight coming in 3.5 lbs over the contracted max weight limit. Thompson had no desire to travel back home after coming all the way to England so he accepted the bout anyway. When all was said and done, the MMA media and critics called it some of the worst judging in MMA they had ever seen as the England judges gave the bout to Till by unanimous decision, 48-47, 49-46, 49-46. Thompson hasn't fought since then so he's basically coming off a 9-10 month layoff. Woodley fought 4 months after facing Thompson, defeating Demian Maia by unanimous decision. However, after seeing Thompson had lost to Darren Till in England, Woodley wanted to fight Till. Seeing what happened to Thompson, Woodley made it clear he didn't want to fight Till in England and have the same fate happen to him that Thompson was delt. Instead, they fought in Dallas Texas where Woodley would not let this one go to the judges anyway as he defeated Darren Till in round 2 by D'Arce choke submission. Woodley took 6 months off before facing Kamaru Usman at UFC 35 in Las Vegas, Nevada. Sadly for Woodley, Usman defeated him by unanimous decision and with the win, took Woodley's UFC Title. So who gets the next shot at Kamaru Usman and the UFC Title? Well, UFC has chosen to weed out the top contenders first. 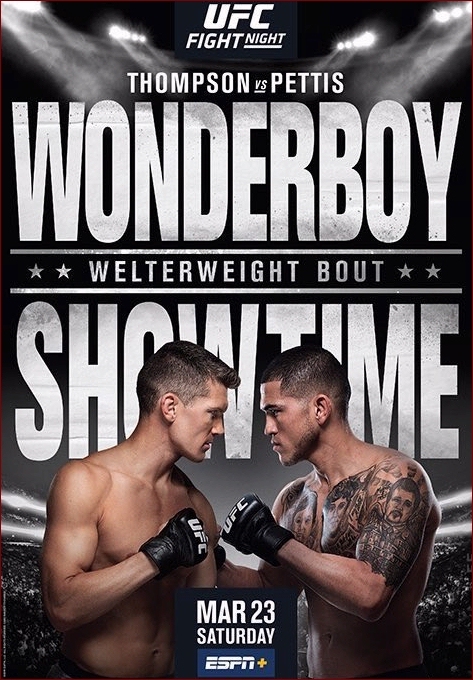 Here we are, this weekend looking at a welterweight bout between former two-time title challenger Stephen Thompson and former WEC and UFC Lightweight Champion Anthony Pettis (21-7). However, this bout has an interesting tie in, and not just the one about Thompson facing 2 Duke Roufus opponents within a year. The majority of MMA fans who know Thompson's also know his Karate background, simply because that's all everyone talked about when he came into the UFC. Thompson started training at age of 3 and first competed in kickboxing and karate at the age of 15. He holds Black belt ranks in Tetsushin-ryu Kempo, American Kickboxing and Jujutsu. He studies Brazilian Jiu-Jitsu under Carlos Machado who is also his brother-in-law. As a Kickboxer Thompson had an overall amateur and professional record of 58-0 before turning his focus to MMA. However few may be aware that Pettis has also trained in Karate. Pettis started training in Taekwondo and boxing at the age of 5 and now holds a 3rd degree Black belt in Taekwondo as well as a Black belt in Brazilian Jiu-Jitsu. He has also trained in the Martial Art known as Capoeira and in Muay Thai. One of Pettis best highlights is when he ran or jumped up on the cage fencing and did a flying kick off the cage to hit Benson Henderson with a head kick. Some claimed it was staged by both fighters, but that's an easy claim by critics who can't do such a move in the first place. Many others say the move enhanced his nickname, Anthony "Showtime" Pettis. - CLICK HERE. The jump off the cage kick is not the only unique move for Pettis. He also has a cartwheel kick which has also become a trademark of his. This is all part of his surprise style of fighting which in many ways like Thompson, includes lots of he will often set-ups and fakes as well as dropping his hands and even sometimes dropping on purpose to his hands and knees to make himself look like he's at a disadvantage and then counter with something like a sitting kick to his opponent. "UFC matchmaking has taken new dimensions in the advancing age of social media. Following a social media exchange between Anthony Pettis, who asked the fans if he should entertain a move up to welterweight to fight "Wonderboy", and the latter welcoming the offer, ESPN's Ariel Helwani has reported that a fight between the two has been verbally confirmed." "How tall are you? So I can know in advance how far to step back when you fall down!" One of my Favorite Pictures and Wins for @twooodley vs Wonder Boy because everyone said you couldn't. I am grateful for my father teaching & coaching me Karate, Tae Kwon Do and old school PKA Full Contact Karate/American Kickboxing. I also competed in Sport Karate from age 6-18 years old along with numerous years of being a nationally ranked fighter. My 1st 4 years of Kickboxing Fights were under American Kickboxing Rules and my oldest brother Rick is one of the greatest Champions ever in that rule style. Pettis' last fight in the Octagon resulted in a "Fight of the year" candidate with him being on the losing end. A loss to Tony Ferguson by TKO (corner stoppage) at UFC 229 this past October 6, 2018 in Las Vegas, Nevada. As for trash talkin, it was clear in the Thompson - Woodley bouts, Woodley was the one talkin, Click here for a Heated Argument of Tyron Woodley vs Stephen Thompson UFC 209 ) and after their first match-up, he had very little, if anything respectful to say about Thompson. As for Thompson, he continued to be polite and show respect for Woodley as he has for every person he meets and or fights. Thompson gave Woodley far more respect in a game where outrageous actions like those of Conor McGregor seem to make far more headlines over doing good things as Thompson has been accustom to as an instructor at his families martial arts school. His father, Ray Thompson isn't much of a "Smack Talker" either. More of a man of few words and lots of action when it comes to the fight game. The family owns and operates the largest martial arts school in South Carolina ( Upstate Karate ) with somewhere around 8 or 900 students. The growth and success of their operation is obvious as they just recently broke ground on a new "Mega" Martial Arts school to move to once completed.